Steve Wasserman reported that the police said that Dowell, a construction worker, “had been killed by a single shotgun blast to the back and head; they claimed that he had been caught burglarizing a liquor store and, when ordered to halt, had failed to do so.” Wasserman said that the “coroner’s report told a different story.” Dowell’s body “bore six bullet holes”—and “there was reason to believe Dowell had been shot while surrendering with his hands raised high.” Dowell’s mother believed that the police had murdered her son—but an all-white jury found that the young man’s death was “justifiable homicide.” Wasserman said that many people in North Richmond didn’t agree with the jury’s decision. The Panthers showed up armed and in uniform and closed off the street. Word had spread and almost four hundred people of all ages came. Many working-class and poor black people from North Richmond were there. They wanted to know how to get some measure of justice for Denzil Dowell and in turn how to protect themselves and their community from police attacks. People lined both sides of the block. Some elderly residents brought lawn chairs to sit in while they listened. Some of the younger generation climbed on cars. Speaking in language that today would make Wayne LaPierre cry like a child — the NRA of the time was curiously supportive of the Act in question — Don Mulford said he was proposing his law to keep us safe from “nuts with guns,” especially the ones who lived in “urban environments.” (No, you don’t need the Enigma machine to decode that one.) The law passed. Governor Reagan signed it, and that’s how history was made. NOTE: I know my post hasn’t touched on the subject of Michael Brown’s death and what has been going on in Ferguson, Missouri. I thought some of you might make a connection. Do you think there is one to be made? 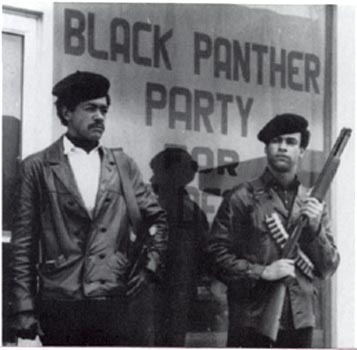 This entry was posted in American History, Courts, Crime, Equal Rights, History, Justice, Law Enforcement, Local Government, Murder, Politics, Propaganda, Racism, States, United States and tagged Black Panther Party, Bobby Seale, California, Denzil Dowell, Ferguson (MO), Huey Newton, Mulford Act, NRA, Open Carry, Ronald Reagan. Bookmark the permalink. How would it be received if the protesters in Ferguson walked around open carrying like in the Bundy Ranch protests? Why did the Feds hold their fire, why did they not fire tear gas canisters, use smoke bombs, loud sound weapons? Why were those people treated a differently? Because they were white and all were loaded for bear? How about those Tea Party protesters proudly open carrying their guns durin all those Tea Party rallies? The double standard is very apparant. “The double standard is very important” Yep, Today, someone with a knife was shot and killed. Given German police fired all of 86 bullets last year and half of those were warning shots, we are left with boys pretending to be men who like to shoot. The Ferguson cops didn’t choose their race but they are sure choosing which stereotypes to persist in the present. If you have to shoot six times at an unarmed person, even one who is “bullrushing” (whatever that is), it’s because you were already terrified out of executing Plans A – Y. And that terror was there long before the first 911 call arrived in Ferguson. Only dash cams and head cams and unholy lawsuits are going to have any hope of denting this Papers, Please mentality the cops have. And the advice from a 17-year vet from the LAPD? Do as I’m told or get hurt. Swarthmoremom, why do you think we never see any women pulling triggers? It’s so stark, and yet we never discuss it. Half the population is missing from the conversation. Whither the imbalance and why can’t we talk about it, do you suppose? State gun control laws were not controversial—they were the norm. Within a generation of the country’s founding, many states passed laws banning any citizen from carrying a concealed gun. The cowboy towns that Hollywood lionized as the ‘Wild West’ actually required all guns be turned in to sheriffs while people were within local city limits. In 1911, New York state required handgun owners to get a permit, following an attempted assassination on New York City’s mayor. (Between 1865 and 1901, three presidents had been killed by handguns: Abraham Lincoln, James Garfield, William McKinley.) But these laws were not seen as effective against the Depression’s most violent gangsters….